If you are reading and understanding this, perhaps you would enjoy other products that include words. To this end, may I point you in the direction of an excellent writer by the name of Laurie Jed Duthie, who has recently published a collection of his excellent short stories through Amazon. Through the magic of technology, his words can appear before you on a computer screen, or on something called a "Kinned All", which is some kind of thing that young people have these days. You can click all you want; you can't look inside. You'd best get to Amazon then. 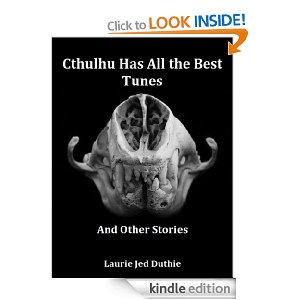 So point your browser at http://www.amazon.co.uk/Cthulhu-Tunes-Other-Stories-ebook/dp/B00BJK97S6/ref=sr_1_sc_1?s=digital-text&ie=UTF8&qid=1362342965&sr=1-1-spell, bang in your details and bob's your uncle - you've got in on the ground floor of a promising writer and can egregiously gloat to your friends and family when he becomes stunningly famous. Do it! DO IT NOW.